FARMINGDALE, N.Y., March 22, 2018 – EpigenCare Inc., a personalized skincare startup company, has been named by Johnson & Johnson Innovation as a finalist in its Digital Beauty Quickfire Challenge. The challenge is designed to identify, recognize, and support the most innovative and future-forward digital beauty solutions. One of the key innovation areas that the challenge focuses on is personalization tools to simplify product selection and build regimen in a way that empowers consumers to make better informed skincare choices. EpigenCare has developed a direct-to-consumer skincare test that assesses the current state of one’s skin by looking at epigenetic markers associated with quality indicators including aging, elasticity, moisture, pigmentation, and more. Epigenetics is the study of biological mechanisms (e.g., DNA methylation) that could activate or deactivate a gene’s function over time. Since a person has the same genes throughout his or her entire life, only epigenetic — rather than genetic — profiling could accurately reflect the dynamic and current state of one’s skin. The company is currently working on a complementary digital platform that skincare companies can use to match their existing products to consumers on a personalized basis. The matching process is through a recommendation algorithm based on the epigenetic effects of product ingredients on the consumers’ tested epigenetic markers of their skin. To ensure consumers’ privacy is protected, EpigenCare is implementing blockchain technology on the digital platform such that consumers are designated with a blockchain transaction ID rather than with any personally identifiable information. The company’s business model is for consumer data to be used only for one’s exclusive benefit in the form of personalized products. Through the decentralized blockchain ledger, consumers can choose to audit how their data is being used, thereby eliminating the perceived intrusiveness often associated with direct-to-consumer tests requiring DNA. EpigenCare also plans to implement machine learning with its epigenetic data, which can be combined with photo imaging of skin for an artificial intelligence based personalization method. EpigenCare will present at the JLABS technology center in San Francisco, CA on March 27th. In addition to a $50,000 grant, Johnson & Johnson Innovation will provide winners with access to a network of experts, residency for up to one year at JLABS incubator, and admission to a Johnson & Johnson Consumer Experience Center (CxC). Winners will be able to design and deploy a research initiative through the CxC. FARMINGDALE, N.Y., March 15, 2018 – EpigenCare Inc., a startup company for personalized skincare based on epigenetic testing, disclosed its intentions to bring epigenetics into mass consumer adoption through big data accumulation, bioinformatics, and machine learning. In contrast to a rising number of companies that improperly exploit the field of epigenetics in a pseudo-scientific manner, EpigenCare will generate data through consumer use of EpigenCare’s upcoming direct-to-consumer skincare test and high-throughput sequencing in its lab. This strategy will provide significant insight into epigenetic correlators and data points, thereby fast-tracking research in a field that has long been confined to limited studies in academia. Identical twins have the exact same genetic sequence, yet will have entirely different DNA methylation levels (an epigenetic mechanism), which can be reflected in the skin quality. Current personalization of skincare is largely based on consultation and genetic testing. Without a scientifically-grounded test to assess skin properties, consultation-based solutions can only identify a few skin types on a superficial basis. This approach is typically too generalized such that most individuals receive very similar product recommendations for skincare. As for genetic-based tests, these methods often rely on a gene’s single-nucleotide polymorphism (SNP). SNPs are established at birth and cannot be altered or reversed during one’s entire life and thusthey are unable to represent the dynamic changes of functional pathways which will affect skin quality states. The company has developed a personal skincare test which, using a methylation-specific next-generation sequencing technique, looks at a panel of epigenetic markers strongly correlated with and dynamically reflects skin quality indicators including aging, firmness and elasticity, moisture retention, pigmentation, and others. The captured skin profile can be used for selection of skincare products best suited for the skin’s current state through EpigenCare’s ingredient-based matching algorithm. Epigenetic-based skin profiling is being increasingly recognized as the only viable solution for both personalized and practical skincare since epigenetics, not genetics, determines dynamic changes of skin quality in response to different environment stimuli. 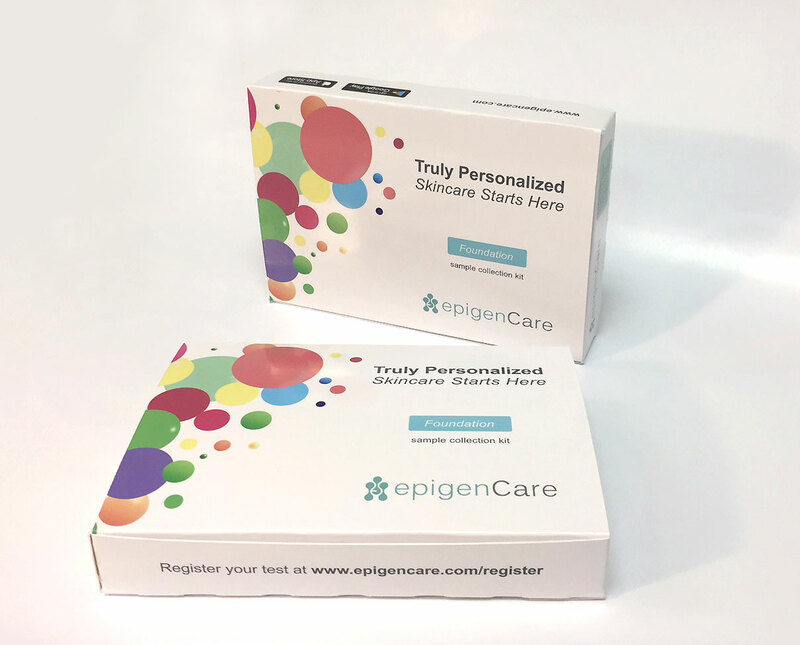 EpigenCare’s initial panel of epigenetic markers was validated in its lab with the assistance of EpiGentek, a related reagent supplier and service provider for epigenetic research. Increasingly better bioinformatics tools and affordable next-generation sequencing, as well as overall rise in computing power, have become powerful accelerators of epigenetic research versus slower benchwork that is often of a more narrow scope. EpigenCare believes that offering a strong value proposition to consumers through its skincare test will rapidly provide the company with data that can be subsequently leveraged by artificial intelligence. Such A.I. could be used to refine epigenetic markers, validate the role of epigenetics against new data points, and ultimately combine photos of one’s skin with predictive modeling to provide low cost personalization solutions. Through its strategy to gather epigenetic skin profiles, EpigenCare is attracting the interest of high profile skincare companies with its platform. They will eventually be able to use EpigenCare’s platform and its recommendation algorithm in order to match skincare products to the consumer in a scientifically personalized manner. EpigenCare is also addressing the consumer’s privacy concerns using blockchain technology. Since blockchain ledgers are tamperproof and cannot be changed or hacked, consumers will be able to transparently verify that their data is being used only for their own benefit. EpigenCare Inc. is a privately held personal epigenomics and digital biotechnology company based in New York. The company offers a direct-to-consumer epigenetics test to assess the dynamic state of one’s skin type and quality. Subsequently, capture of the dynamic quality allows for actionable results from the analysis report such that optimized product options are recommended to the consumer. EpigenCare’s epigenetic technology is supported by EpiGentek Group Inc. Learn more about EpigenCare and its personalized skincare solutions at www.epigencare.com.